I get asked a looooot of questions about my quilling process and how I create my paper decor. I love to help and provide any information that I can about my technique, but what I get asked the most are questions about framing the finished product. How to frame, where to buy frames, and most often, can I just do the framing myself before I ship. Now I’ve taken care of the framing before, and I’ll happily do it again, but it drastically raises the purchase and shipping prices of my work. But, it really shouldn’t be intimidating with a few tips. So, I thought I’d give some advice to take the mystery out of how to frame quilling paper art. This post contains affiliate links. If you click on the links below, I may receive a small compensation to help me finance this site and keep coming up with awesome tutorials and tips! I only ever include links to companies and products that I trust and work with on a regular basis. 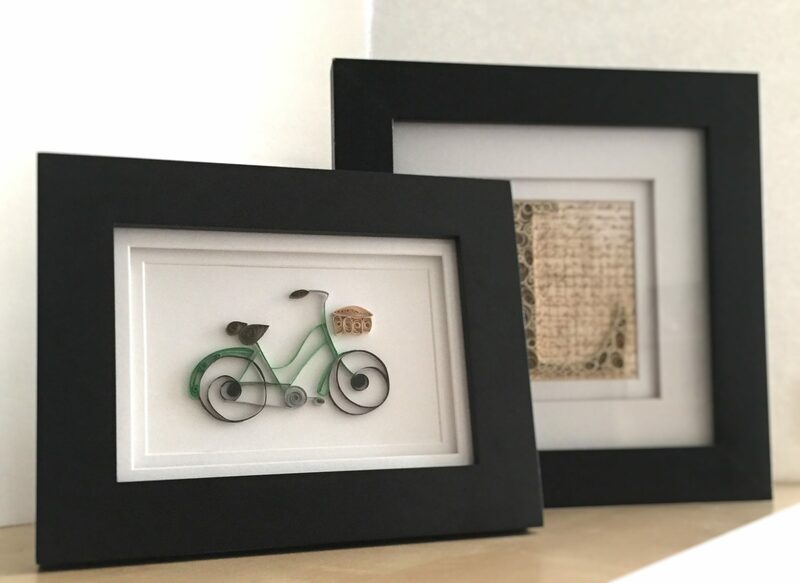 Quilling can be framed just like any other artwork, with a little extra care when choosing just what type of frame you use. Because quilling paper is 3-D and has more height to it than photographs or printed artwork, there is a chance that the rolled paper may get smooshed in many frames that are available in stores. However, there are some options and here are three main ways to frame paper quilling. There are lots of choices for really beautiful, simple shadowboxes, which are generally very deep frames. Often, there is 2 inch gap or more between the back of the frame and the glass, so shadowboxes are used for showcasing more three-dimensional artwork or keepsakes. A benefit of using a shadowbox for your quilling is that there will be plenty of room between the back of the frame and the glass. And some quilling artists use a multi-level technique, which may make their art have even more height, and shadowboxes would be perfect for this. I would recommend using a mat with shadowboxes, just as one would with traditional picture frames. Mats tend to lend a more complete look to the artwork and they also draw the viewers eye in towards the center of the frame, right to your beautiful quilling paper art. Now these types of frames can be a little trickier to find. But they are what I prefer and what I personally use. These double mat frames have 2 layers of mat board, separated by a few pieces of foam that are about 1/4″ thick. This allows for a gap between the frame and the glass, that’s just the right size for most quilled paper. If you already have a frame you think would work with this type of double mat, you could also purchase them separately here. I buy them at my local Micheal’s, and I use their generous coupons every time. They come in a range of neutral colors and all the standard sizes. By all means, frame your quilling without glass! This option will allow you to have the most choices in frames. Without having the concern about the level of space between the frame backing and the glass, you can feel free to pick up any frame, in any style, or any color. Most quilling paper creations are fairly sturdy, so once the framed work is on display, it should be fairly safe and secure, even without the glass covering. Now, it may (especially if it was in my house) get a little dusty from time to time. And, of course, you’ll want to make sure to keep your quilling away from moisture and please, please, please be careful taking the glass out of your frame. I’d love to hear about your suggestions for how to frame quilling paper creations! Leave a comment below and tell me all about your ideas. Thank you for this article, Meredith. I am a newbie to the art form, but knew I was in love with paper the first time I laid eyes on a quilled piece! That’s so great to hear! Don’t hesitate to let me know if you have any questions & Happy Quilling! I am impressed the way you have written about quilling. I learnt from my 9 year old daughter. I loved quilling. This is my passing time. I do not know how to market it. Or this have any market. I have started doing eiffel tower for my son. I will do butterfly for my daughter. I used to do acrlic paintings on fabrics, create my own cards for occassion. Now for a change quilling.thank you again sparing ur time to read. Thank you so much, Brunda! I love to try new art forms, too. If you have any questions, I’ll help as much as I can! I am n new quilling . What type of paper do u use tto put the quilled design on. I did my first one on regular cardstock and used elmers glue and it warped very bad. Help???? Hi there Ardith! I use a very heavy mat board when I’m framing my quillings. It’s extremely sturdy and shouldn’t warp. I also try to use the smallest drops of glue I can, then wipe the excess using a small brush. Maybe invest in a needle nosed glue bottle if you haven’t already. They really help! Hi.can you please tell how can I safeguard my quilling frame which is without glass from dust.should I paint varnish over it. Hi Carolyn! I love a gallery wall personally. That way you can frame them individually and scatter them over one wall. Maybe even bring in a couple non-quilling type accents in a similar beachy vibe to break them up. I think it might be a bit tricky to frame them all in one. I’d love to see how it all turns out. Share a photo if you think of it! Thanks for your response. I have searched for ideas and pictures of others who have framed multiple quilling art but no luck at all! I will share once I figure this out. Excited to see the techniques you have. I have just started quilling and love it. I want to do everything but need help.This is a new passion of mine and hope I can do it justice. So glad to have you here, Rosalind! If you ever have any questions, feel free to reach out. So very cool! I look forward to getting started as soon as my supplies arrive from Amazon next week. Question – do you have a pattern for the bike you show in a frame? I’m a cyclist & would love to do one up once I’m confident enough. Thank you, Michelle! Right now I do not have patterns for quilling designs that I sell on Etsy, like the bicycle. But I’m sure you’ll be able to create your own version soon enough! Hi there, I wanted to know which of these two sealants is better to protect the quilling paper? As I’ve just started out doing quilling on canvases and not to sure which is the best one! Hi Akruthi, thanks for reaching out with a question. I don’t seal my quilling very often. And when I do, I use Mod Podge, so I’m not familiar with using Krylon spray sealants for quilling. I have used them for pastel and charcoal drawings and they work well for those. Whenever I get a question about sealants, I always refer everyone to Honey’s Quilling. She’s done some in-depth articles about sealants. There is one on this page about spray sealants, too. I hope this link helps!